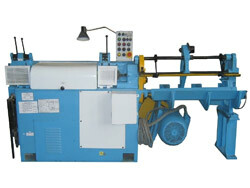 The automatic machine is designed for metal with round section and diameter of 3.0-10.0 mm to be straightened from a bundle and cut into bars of an even length. THE MATERIAL USED is steel with a tensile strength up to 500 MPa. The unit can also be used for straightening and cutting of other materials. the wire is fed into the straightening frame without a readjustment of the straightening bushing.